With the end of the snowy days comes the spring and with spring comes the new anime season! The first show to premiere (as far as the announced dates tell us, mind you) is March’s Ozuma (オズマ). The show is going to be very short, though, will also be a good one to watch for the fans of old-school sci-fi and space fights… or so it seems from the available information. Ozuma (オズマ) is a science fiction short TV series produced by LandQ Studios. Previous franchises of this company are limited to Rinne no Lagrange and Battle Girls – Time Paradox. 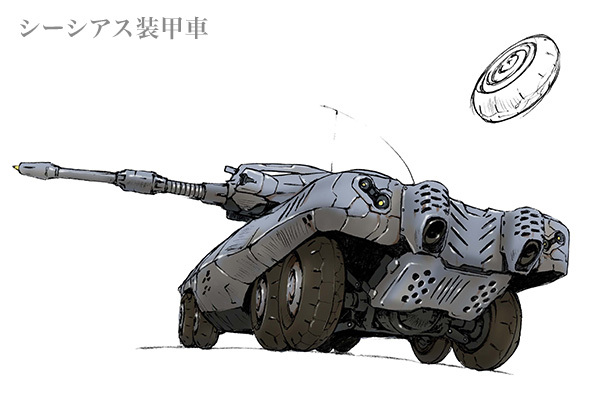 It is created upon Matsumoto Leiji’s unpublished work by the same name. He is popular for his work as a mangaka on Galaxy Express 999, The Galaxy Railways and more. The show will tell the somewhat cliché story about how the radiation from the sun has almost destroyed humanity and Earth as a whole. The results here are the decreased the human birthrate. Controlling and oppressive as governments mostly are, the one active on the planet is as strong as possible, commanding the entire (even though small) population through a special unit of gifted individuals called the IC or also known as the Ideal Children. We follow the life and misery of a certain Sam Coin and his attempt to save the young Maya from the IC by hiding her in trading ship. Well…the script writer’s done some work on “One Piece” and “Naruto”, so he probably knows how an anime is done.